Paul (Pablo) Conrad is a Seattle-based freelance photojournalist with over 15 years experience in covering breaking news, photo essays, portraiture, travel and sports pohotography.He was previously Chief Photographer at The Aspen Times in Colorado for over seven years. He’s won many awards and accolades and his work is published in several books including “Living With Bears’ and Capture My Colorado’. PHOTOGRAPHER: I was the Chief Photographer at The Aspen Times in Colorado. It was the Colorado state cross country ski qualifier at Aspen High School in spring of 2007. It was a general assignment so I just needed a couple of generic photos of the race. Noah Hoffman was the central skier in the photo, he is now on the U.S. Ski Team. Kid is super fast. PHOTOGRILL: How was the photograph made? 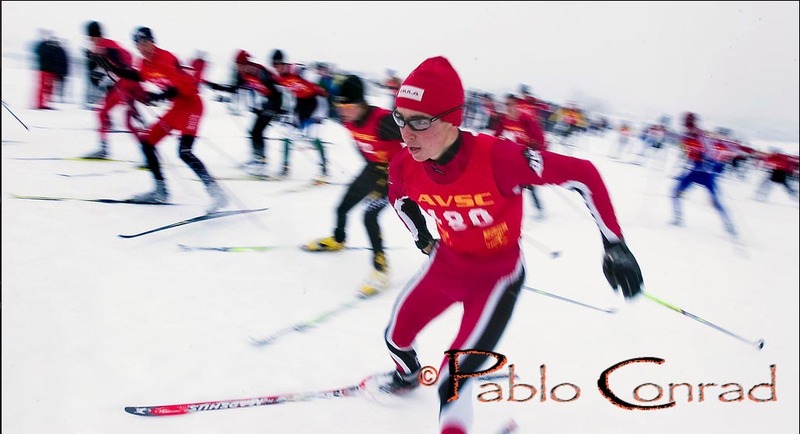 PHOTOGRAPHER: I’ve shot a lot of cross country ski races and the photos began looking the same. It’s also very hard to shoot as you are not allowed to be on course although it may be 10 yards or more wide so it’s hard to get close to the action. During the start, I shot some tight images with a telephoto, quickly switched to my wide angle and dropped to the ground. As they were going by, I decided to try something new. I stopped down as far as I could go and then panned with a slow shutter speed. As the skiers were going by, I focused about 5 feet in front of me, then I panned with them. I would watch them through the viewfinder, then as they approached I began moving with them. I only shot 3 or 4 frames each sequence. 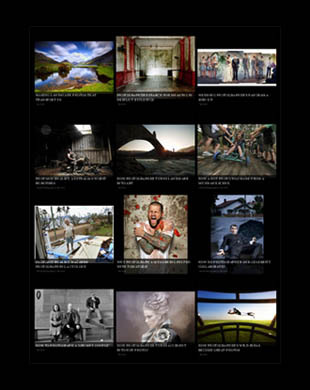 PHOTOGRILL: You must have been close to photograph with a wide angle lens? PHOTOGRAPHER: I didn’t expect the central skier to get so close to me and to be so sharp. It was quite a pleasant surprise while I was down-loading my photos. At the beginning of my career, I was very shy about getting close to people, but that wore off during my first internship at a newspaper. I learned it’s OK to get close, just don’t be rude and obnoxious. PHOTOGRILL: How did you know just what shutter speed to use? PHOTOGRAPHER: Firstly the shutter speed doesn’t have to be as slow when the subject is close. For this picture shutter speed was 1/60th of a second, aperture f/22, ISO 200. The best shutter speed also depends upon how fast the subject is moving so it’s judgment by experience. If the shutter speed is too long you get a ghosting in the main subject instead of a nice sharp subject surrounded by movement. This photo was shot with my Nikkor 17-35 f/2.8 EDIF (at 17mm) mounted on a Nikon D1H. PHOTOGRILL: Tell us about photographing in the snow. PHOTOGRAPHER: I use the old school Sunny 16 Rule. This prevents all the white snow from fooling the meter (while it’s sunny the exposure is f16 at the inverse of your ISO, ie 500 ISO = 1/500th sec). I am a big fan of manual mode so I shoot that way as much as possible. If everything is manual then you have control. I shoot on RAW so as to have the most post processing control in case I make a mistake, maybe it can be fixed. In the snow I keep a couple of extra batteries in my pocket, cold batteries go dead. Warming them up brings the charge back. Also to save power I don’t view the monitor, instead I check the exposure and then just concentrate on composition. Professional camera bodies are pretty well protected from precipitation. I don’t use a bag over the body unless it’s a torrential down pour. PHOTOGRILL: What else has happened to you at the snow? PHOTOGRAPHER: During one assignment I had to photograph a ski race clinic. Olympic bronze medalist snowboarder Chris Klug was an instructor. I’ve known him for years so we went for a few fun runs while the course was being prepped. While we were out a blinding blizzard came it. I could barely see Chris in front of me. I rammed into a flat miner’s road, cart wheeled for about 25 yards down the hill, and then began to flip front to back several times. After I finally stopped, I laid on my back and just started laughing. But, when I sat up, I felt a severe shooting pain from my left ankle to the back of my neck. I ended up in a cast for 6 weeks. All my camera gear was in my backpack and I was more worried that I ruined my gear than about my injury. But, It was all in good shape. I still laugh about it to this day. Chris signed a poster for me that says: Keep riding the mountain and stay on two feet. 1. Keep a dry lint free wiping cloth handy. That way you can wipe your lens and eyepiece of any water droplets that may form. 2. Keep your memory cards in a waterproof pouch in your pocket. 3. Keep fully charged batteries in your pocket. This entry was posted on Saturday, March 26th, 2011 at 7:33 am. It is filed under The Grill and tagged with Action Photo, Creative Photography, People, Photographic Techniques. You can follow any responses to this entry through the RSS 2.0 feed. A useful post shared here. In snow the photography is not an easy task. Thanks Craig for posting this.